Movies go through many iterative changes before they hit the big screen, so perhaps it's of little surprise that Suicide Squad looked quite different in early concept art, with a more psychedelic Enchantress and a Joker with a glasgow smile. What is surprising is how closely Suicide Squad was going to be tied in not only to the upcoming Justice League movie, but Batman v Superman as well. According to Christian Lorenz Scheurer, who uploaded Suicide Squad concept art to his web-portfolio, Suicide Squad would have piggybacked off of Batman v Superman's teased arrival of Steppenwolf, leader of Darkseid's armies (Darkseid being basically the biggest bad guy in all of the DC universe). While Steppenwolf isn't mentioned by name, there are a few clues nestled in the captions of Scheurer's images. For one, the possessed monsters our anti-heroes face are referred to as "parademons" - parademons make up most of Darkseid's armies in the comics, and there's no reason to think they won't in the movies. Second, concept art titled "A GOD" shows a very large, imposing figure with massive horns, reminiscent of the creature seen in the deleted Batman v Superman deleted scene "Communion," which shows Lex Luthor talking to Steppenwolf. 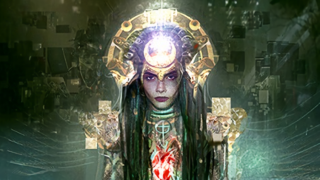 But perhaps most convincing of all, one piece of concept art describes Enchantress' device as a "boom tube." Boom tubes are the portals that Darkseid and his underlings use to quickly travel around the universe, and another piece of concept art shows the aforementioned god arriving on Earth, with a magical-looking aura swirling behind him. Personally, I'm not sure how I feel about this. Steppenwolf is a threat far too large for the Suicide Squad to take on, so they would've needed to stop Enchantress before he arrived, and the movie would've needed to spend time building him up as a threat to take seriously for there to be a proper sense of dramatic tension. Throw in the fact that the Communion scene was absent from the theatrical cut of Batman v Superman, and many in the audience could end up just plain old confused as to who this "god" was. On the other hand, it would be nice to see Warner Bros. do some more worldbuilding for its cinematic universe. What do you think? Should Suicide Squad have stuck with Steppenwolf or are you happy with how the plot turned out?